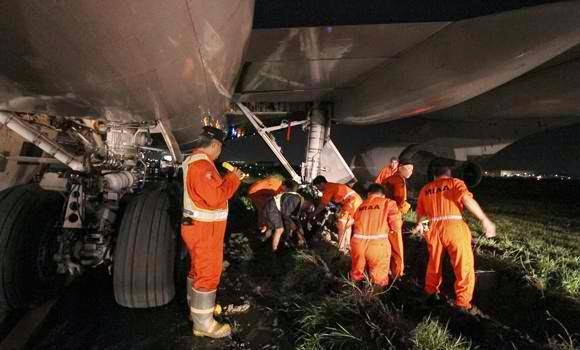 Aviation Updates Philippines - A Saudi Arabian Airlines Boeing 747-400 skidded off the runway of the Ninoy Aquino International Airport on August 5, 2014, at 7:03 PM. The flight, which was Saudia Flight SV871, got stuck in a muddy portion of the runway when it was taxiing for take off. Flight SV871 was bound for Riyadh when it accidentally missed the runway. The flight carried 298 passengers with 26 crew members. It was operated by Capt. Alfaraidhy Abdulmajeed Abdulraheem and Capt. Al Bassam Adnan Mohammed. However, the Civil Aviation Authority of the Philippines issued a NOTAM and sent an Aircraft Accident Investigation Inquiry Board (AAIIB) investigators to investigate and determine the cause of the accident. The NOTAM was cancelled on Wednesday. Meanwhile, eight flights were diverted to the Clark International Airport due to the overnight closure of runway 06/24. This includes Philippine Airlines Flight 307 HKG-MNL, All Nippon Airways Flight 949 NRT-MNL, Dragon Airways Flight 931 NRT-MNL, Japan Airlines Flight 745 NRT-MNL, Delta Airlines Flight 473 NRT-MNL, Singpore Airlines Flight 918 SIN-MNL, Philippine Airlines Flight 469 ICN-MNL, and Etihad Airways Flight 428 AUH-MNL. While another 3 flights was diverted to the Mactan-Cebu International Airport. This includes Jeju Air Flight 2305 ICN-MNL, Asiana Airlines Flight 703 ICN-MNL and Malaysia Airlines Flight 804. This brings the total diverted flights to 11.